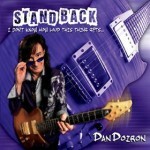 Share the post "Album review: DAN DOIRON – Stand Back I Don’t Know How Loud This Thing Gets"
Every once in a while you stumble across a blues album that makes you wonder why you hadn’t come across the artist before. And with a title like ‘Stand Back I Don’t Know How Loud This Thing Gets’, Canadian blues rocker Dan Doiron isn’t holding back with his message. Curious then, that this album has a lot more musical depth than it’s title suggests. The 10 well crafted, self penned songs are full of deep grooves, subtle playing and thoughtful arrangements that make good use of backing vocals. Doiron surrounds himself with a set of intuitive players who capture the essential feel of his soulful, funky, blues-rock that showcases his melodic sensibility, lyrical ability and instrumental versatility. Dan is a subtle guitarist who knows the value of dynamics, space, touch and tone. He rarely wastes a note, alternatively thickening his tone and then switching to a more sinuous attack. He’s a ‘player’s player’ who gets inside the material and colours his songs with an empathetic feel that always supports the arrangement rather than dominates it. He’s joined by feel bassist Keith Doiron who constantly underpins Dan best work. He digs deep for unison parts with the guitarist, as the band shifts from rock and blues through funk and soul to a surprisingly laid back finish with ‘Once And For all’, complete with a Gary Moore style bluesy guitar figure. The album actually open with some big band bluster – all soaring guitar and pumping horns – but quickly settles in the soullful ‘You Give Me Shivers’, on which Dan’s husky vocal is offset by Renny and Mahalia Smith’s backing vocals. The two singers also provide a gospel style call and response on the chorus of the guitar driven ‘Killing Each Other Trying To Get Into Heaven’. Sandwiched between the two, is the tightly wrapped, stop time funk and intricate guitar work of ‘My Kind Of Trouble’, a song given extra punch by Kim Dunn’s organ fills. The album ebbs and flows because of some thoughtful sequencing, subtle changes of pace, undulating grooves and a guitarist whose most belligerent moments are always an essential part of the song. The title track for example, is a blistering big band arrangement that highlights both Dan’s ability as a guitarist, vocalist and arranger, on a tension building, riff driven piece that he resolves with coruscating solo. There’s humour too on ‘ Don’t You Know Who You I Think I Am’, on which drummer Mike Carroll’s propulsive stick work and Kim Dunn’s organ stabs set up a percussive groove over which Dan adds a defining solo and a funny rap: ‘Now who do you think showed Clapton all those licks, You know Buddy Guy stole all my tricks’. He adds a wah-wah solo on the chimed note groove of ‘Dance Naked’, and trades licks with John Cambelljohn’s immaculate slide playing on another beautiful nuanced groove called ‘Painted Up’. There’s still time for some guitar and flute driven double lines on the greasy blues of ‘Slippin’ Back Into The Dip’, before flautist Brian McConnell’s solos over a cool organ, as the band stretch out in style. This entry was posted in ALBUM REVIEWS, ALBUM REVIEWS (Mobile), All Posts and tagged album, Brian McConnell, Buddy Guy, Dan Doiron, Eric Clapton, Gary Moore, John Camblelljohn, Keith Doiron, Kim Dunn, Mahalia Smith, Mike Carroll, Renny Smith, review, Stand Back I Don't Know How Loud This Thing Gets. Bookmark the permalink.